Create a list of all the companies in your area (large and small) and send them personalised emails to let them know about your teambuilding events. Copy and paste the write-up in an email and attach your teambuilding flyer. Title: UNLEASH YOUR TEAM’s creatiVE SPIRIT WITH CANVAS CLUB! Are you looking for something different to do for team building or your year-end party this year? Getting crafty with your fellow colleagues is a great way to let your hair down, bond and learn a new skill together. We offer group projects which ensure the whole team is engaged and teaches the art of working together toward a common objective. Create a giant artwork for the office with team collaboration or learn how to make modern macramé plant hangers. Title: Ontgin jou span se kreatiwiteit saam met Canvas Club! Is jy opsoek na iets anders vir [naam van besigheid] se eindjaarfunskie of volgende spanbou geleentheid? Canvas Club fasiliteer interaktiewe, kreatiewe en sosiale kuns & kunsvlyt projekte - jy en jou span kan leer om moderne macramé plant hangers te maak of saam werk aan 'n kleurvolle, grootskaalse kunswerk wat die kantoormuur kan optekikker. Want to try something different this year? Unleash your team’s creative spirit with @canvas.club! We offer group projects which ensure the whole team is engaged and inspired. Contact me at [name]@canvas.club to book your team building session today. It’s a great opportunity to let your hair down, bond and learn a new skill together. TITLE: host a unique and creative get-togethers for colleagues with Canvas Club. Do something completely different this year! Create a giant artwork for the office with team collaboration or learn how to make modern macramé plant hangers. Canvas Club has loads of fun projects for you to choose from. 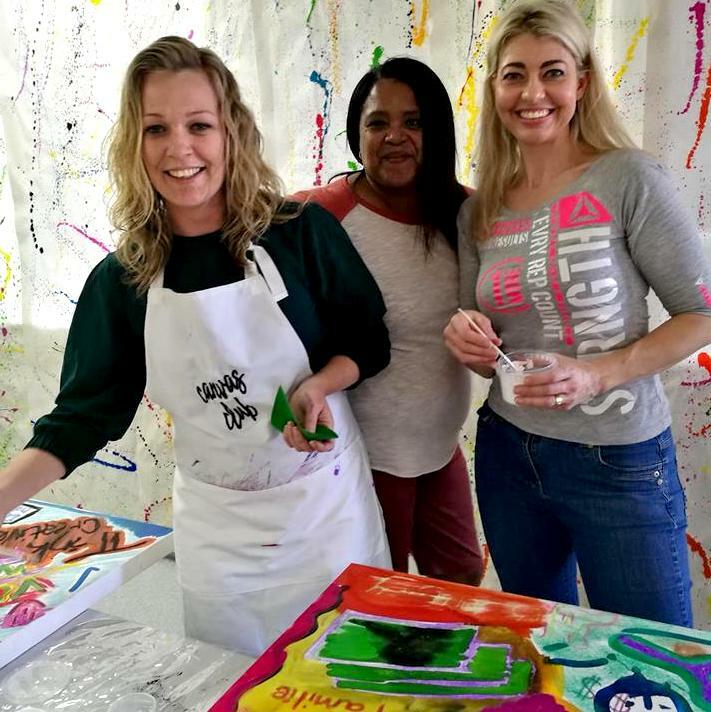 Getting crafty with your fellow colleagues is a great way to let your hair down, bond and learn a new skill together. Our projects ensure the whole team is engaged and inspired and teaches the art of working together toward a common objective. Contact [name] at [name]@canvas.club to book your event and take your team on a creative journey that will leave everyone with wonderful memories and a beautiful masterpiece.